Silk Threads for lace making and other thread crafts. Silk Threads There are 4 products. Seta Reale Nr100. PLEASE NOTE THAT SETA REALE IS NOw DISCONTINUED. WE STILL HAVE SOME STOCK - PLEASE CALL ON 01425 483450 FOR AVAILABILITY. Seta Reale Nr30. PLEASE NOTE THAT SETA REALE IS NOW DISCONTINUED. WE STILL HAVE SOME STOCK - PLEASE CALL ON 01425 483450 FOR AVAILABILITY. 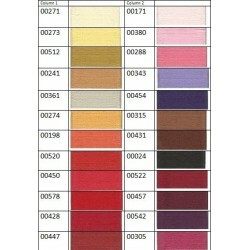 FRESIA Silk Hanks 15/3 (ideal for scarves). Please call for colour range. 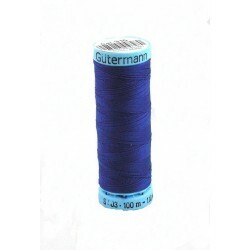 Guterman's Silk. PLEASE SELECT THE COLOUR BY ENTERING THE COLOUR NUMBER AND QUANTITY IN THE PRODUCT CUSTOMIZATION TAB.